Tatiana Lopes, an undergraduate student from Brazil, conducted light and shadow studies on the roof of Phelps County Bank’s downtown drive-through as part of the solar installation project. 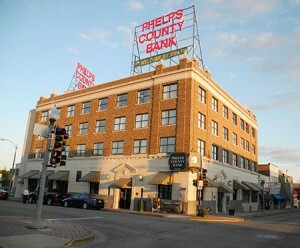 Phelps County Bank’s downtown Rolla location will be drawing some of its power from the sun next spring, thanks to a partnership between the bank and Missouri University of Science and Technology. The historic four-story building at 718 N. Pine was once the Edwin Long Hotel and has been the home of Phelps County Bank (PCB) for more than 50 years. Missouri S&T researchers and students have been working with PCB over the summer to measure sunlight and shading patterns on the drive-through roof. The researchers will use that information to design a solar-powered energy system to provide electricity for the ATM machine, lighting and other electrical systems at the drive-through. “Phelps County Bank has a strong interest in renewable energy applications, and they approached us for assistance,” says Dr. Curt Elmore, professor of geological engineering at Missouri S&T. He and Dr. Mariesa Crow, the Fred Finley Distinguished Professor of Electrical Engineering at Missouri S&T, are co-leading the project. The professors enlisted the help of students from Missouri S&T as well as from other universities who were on campus over the summer as part of a National Science Foundation program. 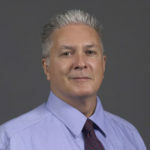 The NSF’s Research Experience for Undergraduates (REU) program at Missouri S&T focuses on technologies for renewable energy application and management and is under the direction of Dr. Jonathan W. Kimball, assistant professor of electrical and computer engineering. Tatiana Lopes, an undergraduate from Pontifical Catholic University of Rio de Janeiro, Brazil, was the principal student involved, giving a distinct international flavor to the project. Elmore and Dr. Jeff Cawlfield, vice provost for undergraduate studies at Missouri S&T, developed a student exchange program with PUC-Rio. ”We were very pleased when our colleagues at PUC-Rio recommended Tatiana as a participant in our summer renewable energy program,” Elmore says. In the coming months, Elmore and Crow will assist in the installation of the photovoltaic (solar-powered) energy system. Phelps County Bank plans to have the system running by next spring. There are solar powered dusk to dawn lights that need no electrical connections,maybe a good application. Panel fit contour of pole so no wind load.